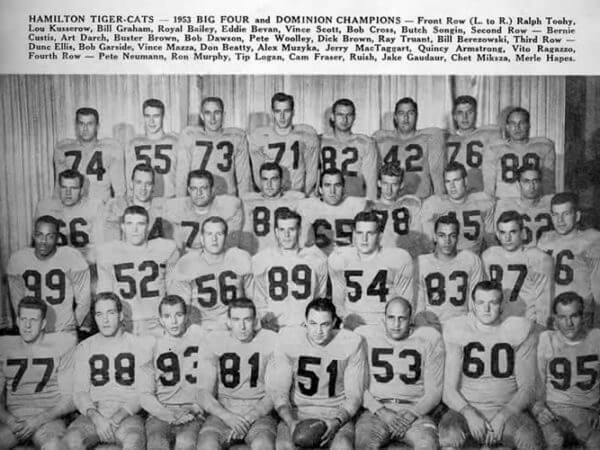 The Tigers and Wildcats amalgamated in 1950 to form the Hamilton Tiger-Cats that would compete in the IRFU. Under the guidance of prominent and distinguished local leaders such as Ralph “Super-Duper” Cooper and F.M. Gibson, it was decided that the two teams should merge as one that would represent Hamilton. Cooper was named team president and Carl Voyles served as head coach and general manager. A contest was held among the fans to determine the colors for the newly formed football club; the result was a combination of the two clubs’ colors: yellow, black, red, white and blue. Over the years, the colors have evolved to gold, black and white and remain to this day. In 1950, the Hamilton Tiger-Cats began playing in Ivor Wynne Stadium, until 2012 after which it was demolished and replaced with a new stadium on the same site, Tim Hortons Field, in 2014. The 41st Grey Cup game was the Canadian Football Championship in 1953. Hamilton Tiger-Cats defeated Winnipeg Blue Bombers 12-6 at Toronto’s Varsity Stadium in a game which ended on a controversial pass incompletion. The 45th Grey Cup was the Canadian Football Council’s (CFC) championship game of the 1957 season, which was played on November 30, 1957. The Hamilton Tiger-Cats defeated the Winnipeg Blue Bombers 32–7 at Varsity Stadium in Toronto. This was the first Grey Cup game to be covered on coast-to-coast television. The 51st Grey Cup took place on November 30, 1963, at Empire Stadium in Vancouver, British Columbia, and decided the Canadian Football League (CFL) champion for the 1963 season. The Hamilton Tiger-Cats defeated the BC Lions 21-10, in front of 36,545 spectators. The game is best remembered for a controversial sequence involving American players Angelo Mosca and Willie Fleming. 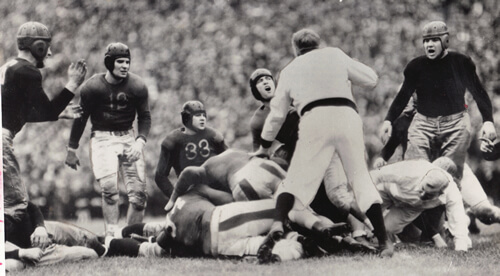 Mosca was accused of kicking Fleming’s head while the latter laid on the field. Fleming would leave the game, leading to a long-standing grudge between alumni of both teams. The 53rd Grey Cup, also known as the Wind Bowl, was hosted at CNE Stadium in Toronto on November 27, 1965. The Hamilton Tiger-Cats defeated the Winnipeg Blue Bombers 22-16. The 55th Grey Cup was played between the Hamilton Tiger-Cats and the Saskatchewan Roughriders on December 2, 1967, at Lansdowne Park in Ottawa, before 31,358 fans and was won by the Tiger-Cats by a score of 24 to 1. The 60th Grey Cup was played on December 3, 1972, before 33,993 fans at the Ivor Wynne Stadium at Hamilton. It was the last Grey Cup to be played in December. The Hamilton Tiger-Cats defeated the Saskatchewan Roughriders 13-10. The 74th Grey Cup was the 1986 Canadian Football League championship game that was played at BC Place Stadium in Vancouver, between the Hamilton Tiger-Cats and the Edmonton Eskimos. The Tiger-Cats unexpectedly dominated the Eskimos 39-15. The 87th Grey Cup (Canadian Football League championship) was held in 1999 in Vancouver. The Hamilton Tiger-Cats won the game 32–21 over the Calgary Stampeders in a rematch of the previous year’s 86th Grey Cup. The Hamilton Tiger-Cats are a professional Canadian football team based in Hamilton, Ontario, Canada. They are currently members of the East Division of the Canadian Football League. 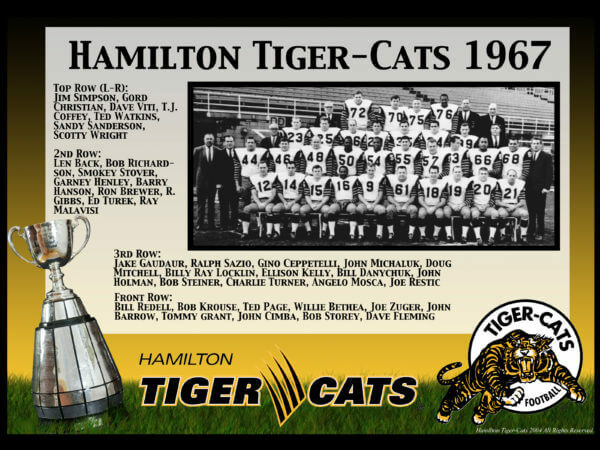 Tiger-Cats - The Hamilton Tiger-Cats originated when the Hamilton Tigers and Hamilton Wildcats merged in 1950, forming the Hamilton Tiger-Cats. 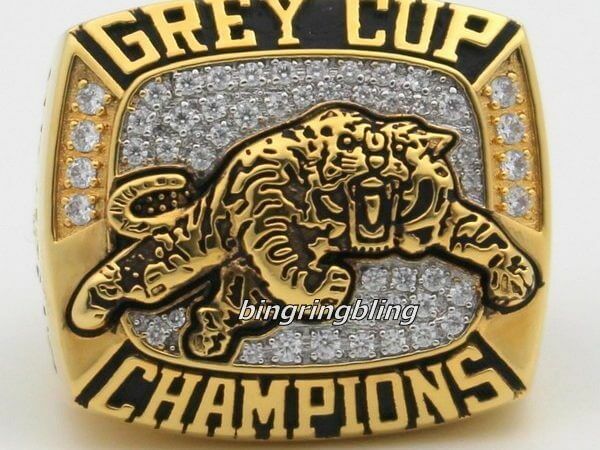 Tiger-Cats is correctly spelled with a hyphen and capital letter "C."
Who is the greatest Hamilton Tiger-Cats?